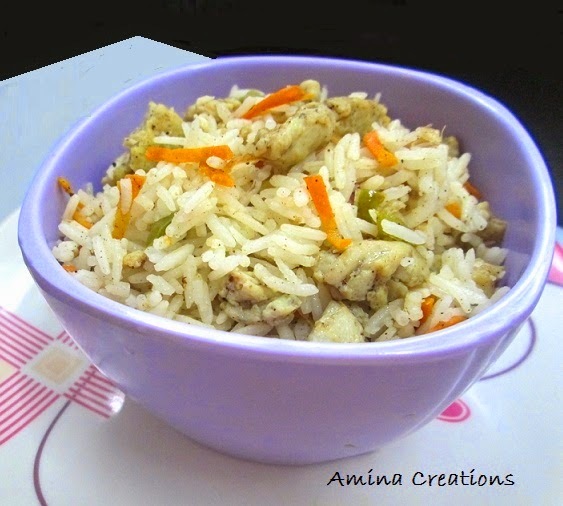 This is a quick recipe of fried rice made using ingredients that are available in most Indian homes. I have added carrots for colour and taste. You can also add other veggies of your choice. Beat the eggs in a bowl, add 1 tsp salt and 1 tsp pepper powder and whisk till well mixed. Heat 2 tbsp oil in a thick bottomed pan, add the egg mix and wait for a few seconds for the omelette to start forming. Break it into small pieces and cook well. Once done, transfer to a bowl and keep ready. To the same pan, add the remaining oil and sauté the onions till they turn golden. Next add carrots and capsicums. Cook in high flame and keep stirring for a few minutes till they are cooked. This may take about 7 to 8 minutes. Then reduce heat, add ginger garlic paste and sauté till the raw smell goes. Add salt and pepper to taste and mix well. Finally add the cooked rice and eggs and mix well. Serve hot with Kung pao chicken or Gobi manchurian. I love Egg/Chicken Fried rice. I usually add some cabbage and soy sauce too.